The following review is for a whole food supplement called Amazing Grass Detox & Digest. This product claims to provide all the daily greens that you need. In addition to this, the manufacturer also claims that the product contains cleansing super-foods and probiotics for soothing digestive support. To find out more about how Amazing Grass Detox & Digest works and the ingredients in this product, read our full review below. 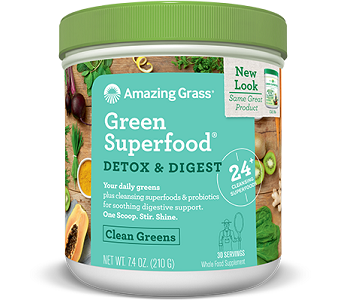 Amazing Grass Detox & Digest contains a very long list of various vitamins, minerals, vegetables, seeds, and fibers. Other than the organic vegetables, the product also contains a detoxifying blend and a digestive blend of ingredients. The detoxifying blend contains apple pectin, ginger root, and organic fennel seed, just to name a few. The digestive blend contains flax seed, quinoa, and peppermint, just to name a few. The manufacturer claims that these 24 cleansing ingredients can help eliminate daily toxins and provide soothing digestive support. The label on the product suggests that a user consume one scoop (7 grams) of product per day. Mix this scoop with an 8 ounce glass of water, juice, or smoothie. The manufacturer does not indicate the best time of day that the product should be taken and if it should be taken with a meal or on an empty stomach. Lack of crucial information like this could cause the product to be less effective than other brands. Unfortunately, due to the blends of ingredients, customers will not know if they are receiving the correct ratios of ingredients to ensure optimal effectiveness. The product can be purchased online from the manufacturer’s website. A tub of 30 servings will cost a total of $29.99. The manufacturer has made the option available for the customer to purchase in bulk. The more product you purchase, the more discount you will receive. You can save up to 25% on you purchase. The manufacturer offers a 30-day money-back guarantee. Unused products that have been returned are subject to a restocking fee of $15. Used or opened products that have been returned will not be eligible for a refund. As a result, first time customers will not be able to test the product and return it for a full refund if it does not work. This is a weak guarantee. The manufacturer provides customer reviews on their official website and most customers seem satisfied with the product, although, there aren’t a lot of reviews. After our analysis of the product Amazing Grass Detox & Digest, we have come across a few positive things. The product seems to contain the correct type of ingredients as seen in other brands. The manufacturer also provides cost effective bundle deals. Unfortunately, we have also come across a few negative things about the product that we do not like. First of all, there is no indication as to the amount of each individual ingredient in the product and customers will not know if they are receiving enough or too much product per day. Also, the manufacturer fails to indicate the best time of day to take the supplement and if it should be taken on an empty stomach or with a meal. Finally, the manufacturer offers a very weak return policy that will not cover you if you try the product. As a result, we are unable to recommend Amazing Grass Detox & Digest as a safe and effective detox supplement.